Researchers are looking into the long-term health risks of climbing Mt. Everest [Credit: Utpala, flickr.com]. Paul Firth was on his way to the final campsite in his 2004 ascent of Mount Everest when an equipment malfunction cut off his oxygen. Rather than risk leading his four-person expedition the rest of the way to the summit, Firth took the team back to its last camp, divided up the remaining oxygen cylinders and headed down the mountain with one other climber. The two remaining members pressed on, summiting and descending safely. Others fared worse: seven climbers from separate expeditions ascending at the same time died soon after reaching the summit. Four years after his firsthand experience with Everest’s hazards, Firth is the coauthor of a study that examines the causes of death on the world’s highest peak. Published December 11 in the British Medical Journal, the study’s results surprised Firth and his colleagues, three of whom are also Everest veterans. 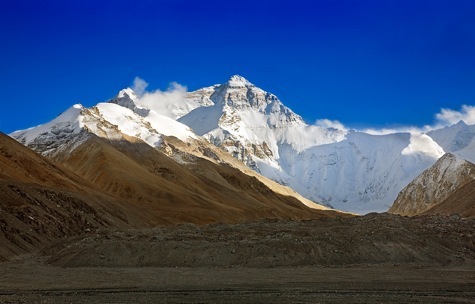 They discovered that damage to the brain, not the lungs, was the overwhelming cause of Everest deaths, and that signs of edema, or fluid accumulation caused by oxygen deprivation, usually struck shortly after climbers reached the summit and began descending. The researchers expected both cerebral and pulmonary edema to be frequent killers at high altitude because both are known to strike climbers in low oxygen environments, but pulmonary edema was surprisingly infrequent in death reports. Even when cerebral edema was not listed as the actual cause of death, the researchers found evidence that suggests it was often a crucial contributor. Though its traditional symptoms—headache, nausea and vomiting—rarely showed up in accident reports, team members of victims reported confusion and fatigue preceding the deaths, which often came from impaired climbers falling or wandering away from their parties. Out of more than 14,000 individual ascents on Everest since 1921, the authors counted 212 documented deaths, or a 1.4 percent fatality rate. Though just seven of these deaths were originally attributed to cerebral edema, the researchers consistently found reports of fatigue and confusion in deaths that may have been recorded as a fall, disappearance, or sudden death. Profound fatigue was noted in 34 deaths and cognitive changes in 21. Climbers who didn’t survive their expedition also generally reached the summit and began descending later in the day than survivors, another indication of fatigue in this group. Only seven deaths were attributed to pulmonary edema, and symptoms related to this condition were rarely reported in other climbers who died. Firth and his colleagues obtained their data from analyses of death reports in the Himalayan Database, a published record of all expeditions on Everest and more than 300 other major Nepalese peaks since 1905. Their study is the first to use this information to look closely at high-altitude deaths on Everest. Cerebral edema occurs when fluid in the brain leaks out of blood vessels and into the surrounding brain matter. Exposure to low-oxygen and low-temperature environments is a major risk factor for this condition. Climbers who use supplementary oxygen are better off than those who try to take on the mountain without it, but even these precautions aren’t always enough to protect against edema. Usually, a pounding headache that results from brain swelling would warn a climber to turn around to avoid brain damage. But because blood volume shrinks as the air thins at high altitudes, less brain swelling occurs before a climber starts to get dangerously confused as a result of the onset of edema, Firth explains. Studies like this one reinforce that all Everest climbers must share Firth’s safety-focused perspective, says Simonson, the Himalayan expedition organizer. As a mountaineer, “you have to be able to understand the symptoms yourself in person and be able to make those hard decisions, such as turning around or descending immediately,” he explains. Climbers who think they can call their doctor from a radio when they start experiencing symptoms, he says, are in for trouble. Future research may shed light on the best way for climbers to deal with the physiological effects of high altitude, Firth hopes. While the dominant strategy has been to minimize exposure by getting up and down the mountain as quickly as possible, he says it may be possible for the body to acclimate to low-oxygen conditions. In that case, mountaineers would fare better by spending more time at high altitudes before their final ascent. Clues could come from the Sherpas who guide expeditions and live in high-altitude environments year-round but are rarely affected by edema. The reason for their success, whether genetic or acquired, remains a mystery — as does much about the impact of oxygen depletion on the body. How are sled dogs able to run for hundreds of miles on end? How does watching sporting events affect your heart rate?